The first football World Cup was held in Uruguay because Uruguay were the reigning champions of the 1928 summer Olympics football tournament AND because it was on the 100th anniversary of Uruguay’s first constitution AND the Uruguayan authorities offered to pay all of the participants’ expenses. Wonder which of those three reasons really swung it for Uruguay?! 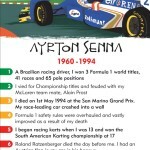 Ayrton Senna, 1 of History Heroes: SPORTS HEROES & 1 of the greatest Formula One Drivers, would be 56 today. 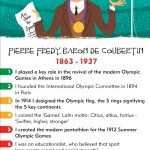 Pierre de Coubertin is a great inspiration for the New Year: Born on the 1st January, he also founded the Modern Olympics!